I recently learned something that I thought I’d share in the light of the Christmas season. Each year, 3.5 million American families bring real Christmas trees into their home. This custom was first introduced in the United States in 1842, by Charles Minnegerode at Williamsburg, Virginia. 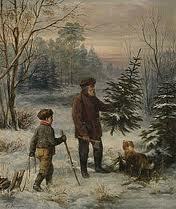 His tree was described as “splendidly decorated” with strings of popcorn, gilded nuts and lighted candles. The fourteen president of the United States, Franklin Pierce, was the first president to set up a Christmas tree in the White House. This entry was posted in Blog, Holiday, The Christmas Tree, Triva and tagged Christmas Tree, Christmas tree info, legend of the Christmas tree, Trivia of the Christmas tree by judydeluca. Bookmark the permalink.